This paper follows a post-colonial analysis that Edward Said develops in his seminal book Orientalism with particular use of and reference to imaginative geographies. Attention is paid to seemingly innocent and power-neutral circulations of knowledge by examining the role Disney's Tarzan plays in shaping individual and societal perceptions of a homogenous 'Africa'. The paper goes on to argue that the systematic development of exclusionary binaries categorising European-ness and African-ness primarily on the basis of race has been sustained and is integral to perceptions of belonging amongst African diasporic communities. Those who identity as Anglophone Africans are of special interest in being subjects of difference who are 'almost the "Same" but not quite'. The African diasporic condition understands that blackness means one must originate from somewhere else that is not Britain. This paper references major thinkers in Black British Studies to unpack this knowledge as well as accepted discourse to narratives of displacement to the members of African diasporic communities in Britain primarily through ideas of the home. It is found that subtle messages present in some Disney films should not be overlooked. This paper challenges the absorbed images of Africa coming primarily from the Western perspective and, through searching, exposes imagined meanings of 'the home' for African diasporas in Britain that most clearly displays the invasive effects these images can have. We all write and speak from a particular place and time, and on the basis of our individual histories and cultures (Hall, 1990: 222). I was born in Britain to Nigerian parents (specifically Yoruba - a particular ethnic group in Nigeria). Having lived my entire life in Britain, I have not yet visited Nigeria despite growing up as a member of the Nigerian diaspora. As individuals living in a society, we are exposed to common processes of socialisation, through which culture is transmitted to us (Blackwell et al. 2008: 16). These processes shape our views of the world and our positions within it (Blackwell et al. 2008:16). Disney is the most primary form of entertainment whereby children engage with and learn about the social world (suggested by Giroux and Pollock, 2010: 34). Although children do not necessarily watch Disney movies with the intention of learning something more than for entertainment value, their 'reception is selective and […] seems motivated primarily by problematics that are focal in their own lives' (Drotner 2002: 116). Following this, I aim to offer a critical view of how growing up in England made Disney - though an American organisation - a huge part of my social landscape, thereby shaping my voice. The Walt Disney Company is a massive driving force behind the 'Americanisation' of the globe (Matusitz and Palermo, 2014; Sandlin and Garlen, 2016). Matusitz and Palermo (2014: 91) describe this as the 'internationalisation of the entertainment values of US mass culture'. Recent statistics support the reach of The Walt Disney Company empire, indicating it to be the second biggest media conglomerate in the world with an annual revenue of $22.5 billion in 2016. As if this was not enough proof, the global relevance and weight of The Walt Disney Company can also be seen in the number of tourists travelling from Britain to the Disneyland theme parks both in the US and France. In fact, the UK is consistently Disneyworld's third-biggest international market behind Canada and Brazil (Dineen, 2016). This, combined with the launch of Disney Channel in 1995 across the UK and its popularity there hitherto, shows there is little doubt that Disney's empire includes British audiences. Critical interest in Walt Disney productions has long been focused on the question of representation in films. Whilst most early scholarship of Disney focused on the question of femininity as it relates to hegemonic masculinity (Stephens 2002: 116), authors such as Ruth Mayer (2002), Mark Pinsky (2004) and M. K. Booker (2009) have begun to question Disney movies beyond this focusing on the apparent neutrality of such Disney films. They (amongst others) point out the nature of the visual stereotypes Disney employs to narrate otherness is an attempt to reinforce the supremacy of Western identity and superiority (see also Di Giovanni 2007: 93). It follows then that this paper is concerned with the politics of representation of the Third World and the Orient. Films such as The Jungle Book (1967), The Lion King (1994), and Tarzan (1999) are examples of Disney spreading 'knowledge' about distant cultures to children. The Lion King and Tarzan are the only two Disney films stated to be depicted somewhere in Africa. Disney's Tarzan is most relevant to me as a British-Nigerian in how England and Africa are clearly contrasted. Moreover, the film was hugely popular in the UK, grossing almost £200 million from time of release in October 1999 to early January 2000 (IMDb, 2017). The 1990s was a decade of uproar in Britain where the racial climate was extremely precarious. Stephen Lawrence's murder in 1993 had exposed the realities of race and racism in Britain, which concentrated around ideas about how far black people did and did not belong in Britain. Statistics seem to support this idea: for example, in 1999, of all ethnic groups in Britain, black people were four to five times more likely to be stopped and searched than non-black Britons. By 2012, this number had increased again to eight to ten times. Damilola Taylor's death in 2000, though not confirmed to be related to race, also in some way paints a picture of what beliefs were like about life in Britain for black people (BBC News, 2010). Damilola was an African boy killed shortly after leaving Nigeria to live 'the good life' in Britain. Stephen Lawrence's murder and the following investigation had already increased negative feeling amongst black communities regarding their experience of life in Britain (Muir, 2012). When it came to the case of Damilola years later, the primary provocation for the mass outrage and discussion about race and immigration in Britain was the time it took - six years and three trials, despite evidence - to convict any of his killers (BBC News, 2010). Thus, the 1990s and early 2000s represent a turning point in Britain where all were forced to consider that non-white people most assuredly did have a different experience of life (Muir, 2012). When viewed this way, it seems necessary to evaluate some of the different ways that everyday experiences of life in Britain differ along racial lines. Using Said's conception of Orientalism and imaginative geographies, this paper uses Disney's Tarzan as a tool to illustrate the Third World as imagined by the West. Said (2003: 54) describes the essence of his imaginative geography using a simple example. He depicts a scene of how people living on a piece of land will demarcate their land - which they call 'ours' - from the 'land of the barbarians' - which is 'theirs'. This he explains as being the universal practice of mental boundaries set up in the collective consciousness regarding the familiar space of 'ours' and the unfamiliar space, beyond that which is 'theirs'. Said emphasises that this practice is entirely arbitrary as the imaginative geography of 'our land/barbarian land' does not require the barbarian to recognise their role as barbarian. They need only be barbarian in our minds to in turn intensify our sense of self. As a subject of difference that is 'almost the "Same" but not quite' (Bhabha 2004: 122; Bhatia 2002: 66), this paper is written from the perspective of the 'insider-outsider'. I am an 'insider' due to my Britishness yet I remain an 'outsider' in my blackness, which is imagined as being incompatible with Englishness. Following an examination of the presentation of Africa in the film, the subsequent sections of this article trace the relevancy of ideas surrounding the notion of belonging that is reflected in Tarzan to narratives of displacement of the members of the Anglophone African diasporic experience. Said (2003: 239) states that 'the Orientalist surveys the Orient from above, with the aim of getting hold of the whole sprawling panorama before him'. It is the ability to do this that makes the imperial project possible (Gregory 1995: 463; Said 2003: 14). Disney's treatment of 'Africa' as one homogenous 'Other' by failing to individualise countries in both of the two movies it claims as being based in Africa is symptomatic of a complete disinterest and dismissal regarding the multiplicity of the continent (reinforced by Massey, 2009). It suggests the unfamiliarity of 'Africa' by portraying it as a single bloc and single story, thereby speaking to a language of generality amongst distinct countries (Adichie, 2009). The opening scene of Disney's Tarzan clearly presents this narrative where the first few minutes set the scene of jungle terrain yet untouched by man: a sprawling nest of trees and animals each indistinguishable from each other. These visual practices of representing Africa involve not only 'demarcating "our space" from "their space", as Said first proposed […], but "our" reaching into "their" space and imaginatively - and eventually materially - appropriating that space and claiming it as "ours"' (Gregory 1995: 463). In missing out local people, Disney cannot benefit from their societies, their stories and their points of view. It is symptomatic of a seizure of control of Africa and what it means to be African from the natives (Pinsky 2004: 185; Mayer 2002: 62; Booker 2009: 65-66). To put it crudely, the film 'depicts a world already in compliance with Burroughs' utopia' based around 'white hero', 'black land' minus 'black people' (Mayer 2002: 64). Disney does this in both The Lion King and Tarzan. It almost seems that Disney (in regard to Africa at least) privileges the depiction of animals over native Africans. Of course, the use of animals in film is a tradition entirely familiar in Disney characters (think Disney's most iconic character Mickey Mouse; also Bohl 1997: 16). However, whilst Mickey Mouse may have been anthropomorphised, 'the environment in which [he interacted was] overwhelmingly human' (Whitley 2008: 7). On the other hand, in Tarzan the animals (as well as Tarzan himself) are anthropomorphised but still 'animal-like'. Couple this with a story told time and time again about Africa from the beginning of the colonial era as a land where the animals freely roam (see also Rich 1976: 33) leads one to reasonably question the implications of the use of animals in the film. This is especially concerning when considering 'the imperialist and anthropocentric ideologies implicit in Burroughs' depiction of the gorillas (and the indigenous Africans) as lesser species' (Stephens 2002: 129) in the original. In this way, Disney's Tarzan misdirects and calls into question the personhood of the African. The fact is that the signification of Africa has been and is still an ongoing conversation, of which the African diaspora are a crucial part. 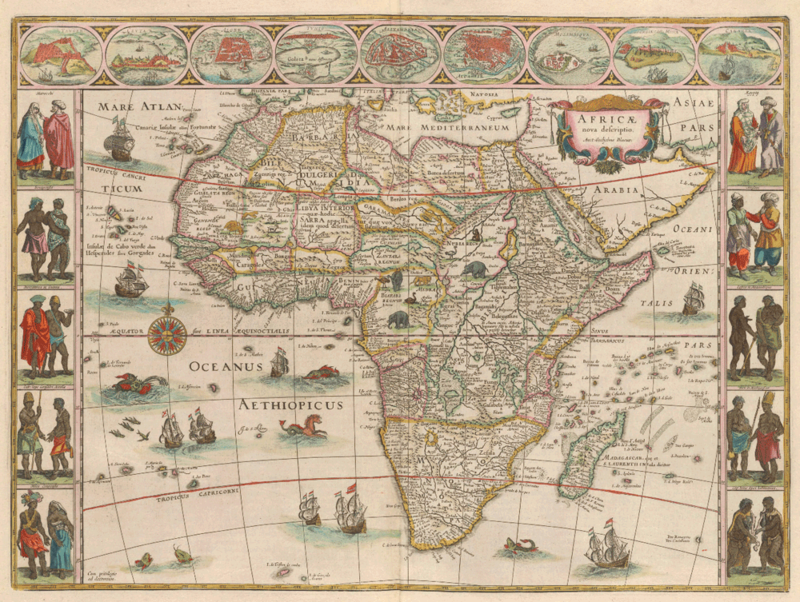 Figure 1 depicts a map described as one of the most decorative and popular of all early maps of Africa and was reprinted numerous times between 1631 and 1667 in Latin, French, German, Dutch and Spanish (Blaeu, 2016). J. B. Harley is perhaps the most widely known scholar on the connection between maps, knowledge and power. He contends that maps are never value-free and provide a way of 'articulating, conceiving and structuring the human world' (Harley 1988: 129). Figure 1 seems to articulate, conceive and structure the animal world. I mention this because Disney's Tarzan is guilty of reproducing the same ideas present in a map that is over 300 years old. An image that, despite some differences, resonates with Burroughs' original story. When asked, Disney defended the absence of natives in the film in an effort to sidestep any racial issues, adding that 'We would never dream of doing anything that would offend anyone' (Mayer 2002: 63-64). However, Disney - whether due to laziness or (though much less likely) more sinister reasons - does offend. By essentially re-presenting a film about Africa centred on a white man and his finding companionship and belonging with a British white woman, Africa is again presented as a place for white people to act in and fight over (Falola and Agwuele, 2009: 231). There always existed the possibility of simply making the character Jane a black woman. Even if she were 'Black British', as opposed to 'African', this may have achieved the same goal in a more constructive way (this is the route currently being followed by Netflix in their portrayal of Tarzan and Jane, which premiered in January 2017). Perhaps in not doing this, Disney highlights how far the alienation of black people continues even on the African continent. Falola and Agwuele (2009: 231) suggest agreement in stating 'Africa cannot belong to the Africans - there do not appear to be any'. Presumably, a film that shows humans in (sub-Saharan) Africa sees no need to depict natives - whether as primary or secondary characters - and consequently abnormalises the black body which does not exist or rightfully belong anywhere in space. Conceivably, as Falola and Agwuele (2009: 217) state, this is because Africa is easy to imagine. Natives just like animals can be depicted and omitted at will because Africa is an empty space that can be anything the writer wants it to be. It is also particularly important to remember that experiencing (and consuming) such representations is crucial for the way in which we construct enduring mental pictures of other places (Light 2008: 7; Hall 1997: 17, 29). This is regardless of whether these ideas bear any real connection with that place in reality. Sandlin and Garlen (2016: xv) suggest that there can be no denials as to how important Disney is 'to global culture, capital, lexicons and history'. Bearing this in mind, along with the message that Tarzan seems to translate to an exotic perception of otherness as well as the representation of Africa, the jungle emphasises an idea of a physically remote world (di Giovanni 2003: 208, emphasis added). For example, when Jane, the Professor and Clayton first arrive in the jungle, they bring with them utensils, art supplies, music and medicines that both baffle and fascinate Tarzan. These are items that the Western world had long since regarded as basic, very readily available items. Where buildings and technology exist in the Western world, they supposedly do not in Africa. Instead, the Africa presented is outside of technology and the basic supplies typical of civilised human life and progress. Moreover, the film seems to reproduce in a latent form (old) imperialistic ideas where England - in the principal form of Jane - is responsible for rescuing the wild man from his savagery by taming and civilising him, teaching him what it means to be human. There is a scene in the movie just after Tarzan meets Jane and subsequently visits the camp she, the Professor and Clayton have set up. Jane is shown using a projector to show Tarzan pictures of what Africa looks like followed immediately by pictures of England where the former is characterised by vines and overgrowth and the latter by stately architecture. Images like this serve only to reflect 'a darkness to be enlightened' by English civilisation (Jarosz 1992: 107) and further distances Africa temporally and spatially as a place that is static, outside modernisation and part of the uncivilised Third World. The character of Tarzan himself also expertly folds distance into difference (Gregory 2004: 17). Tarzan is the orphan of parents who were marooned in the African jungle when he was a baby. Despite his obvious similarity with the other human characters in the movie (principally Jane, Professor Porter and antagonist Clayton) through his humanness (and whiteness), his upbringing makes him inherently different. This is where the 'politics of space' become extremely relevant as 'the construction of identity involves establishing opposites and "others"' (Gregory 1995: 456). In this way, Tarzan establishes Africa and England as binary opposites of each other. For England to represent modernity and civilisation, multi-definitional Africa is reduced to country status and must represent the unfamiliar, barbaric 'Other': primitive, eternal and unchanging (Gregory 1995: 457; Rose 1995: 103-4). Tarzan is completely ignorant of his savage status. Only Clayton, Jane and the Professor are aware. The audience becomes informed by the constant parallels drawn between the characters. Tarzan does not need to know he is a barbarian but he must be so that we can be civilised. Before Clayton, Jane and the Professor are introduced in the movie, Tarzan - along with all the other animals - speaks in an American accent that makes him familiar to the Western audience. However, with the arrival of the other characters from England, Tarzan is relegated to speaking in grunts and gestures, mimicking the words and stances he hears and sees from the others. For example, Tarzan the jungle man, more comfortable on his feet and knuckles, is shown comparing his stance to Clayton's and then doing his best to imitate the traditional and more civilised straight-backed posture of the latter. In this way, Tarzan is portrayed as being almost sub-human and less far along the evolutionary scale than his English counterpart. Tarzan's offering of a different and strange method of communication also correlates with the ideas of Africa and Africans presented in Rudyard Kipling's The White Man's Burden (1899); Joseph Conrad's Heart of Darkness (1899) and Burroughs' original series, Tarzan of the Apes (1912) Each translate an idea of Africans being different in their intimate connection with nature, physicality and methods of communication (Jarosz 1992: 108). Even aside from this, Tarzan's status as both Oriental and Occidental is even more revealing. He is constantly referred to by the only other human characters in the movie as a savage or wild man. Tarzan represents everything that Jane, the Professor and Clayton do not understand; he is completely unfamiliar with the exception of his being human. As his difference in the movie is due solely to his upbringing in the jungles of Africa, what can be inferred by this is that Africa defines Tarzan just as Tarzan defines Africa. In being shown as a product of Africa, he has become a 'son' of Africa that represents the human form of his surroundings. This correlates with a mutually constitutive view of space and subjectivity. Disney implicitly reproduces this idea that Africa produces savages, just as the savage defines Africa (Walker and Rasamimanana 1993: 3, 4-5). This exemplifies Said's description of the production of identities being bound up in the power of imaginative geographies (Said 2003: 332). Given the lack of any native Africans, Tarzan comes to be to some extent - purely by virtue of being the only human raised in Africa depicted in the movie - African. In this way, the role of the marginalised, the outsider and 'Other' is played out under the insignia of whiteness (Mayer 2002: 63) in an almost ingenuous technique of representing cultural otherness using the familiar. Tarzan becomes a man capable of living in two worlds: the savage African jungle and the world of sophistication and civilisation presented in England. This inference is proven reasonable towards the end of the film when Tarzan finds the treehouse his parents used to live in. After discovering and donning one of his father's old suits, an almost iconic scene displays the jungle in the background whilst Tarzan is climbing onto the boat, simultaneously excited to begin his new life in England and reluctant to leave his old one behind. In this way, Tarzan's body becomes a mimetic representation of both the 'Primitive' and the 'Civilised'. Disney reproduces the masculine perfection of Tarzan that originated with Burroughs, showing masculinity that can be read as the Sophisticate's ongoing fascination with the savage and barbaric. Wannamaker and Abate (2012: 176) suggest agreement in adding that Tarzan's upbringing in the 'wild' combined with his whiteness becomes the only route to complete male development. Black British Cultural Studies: A Reader (Baker Jr. et al. 1996) is a useful place to begin a discussion of the pain of dislocation and displacement suffered by diasporic Africans in Britain. The book's central question is whether 'ethnicity's equivalence with nationalism, imperialism, racism and the state' produces specific formulations of the nature of Britishness and Englishness (Baker Jr. et al. 1996: 4). This is unequivocally tied to the primary aim of this paper: to explore the politics of representation present in Disney's Tarzan and its possible relevant effects on the dislocation and alienation of the Anglophone African diaspora. At a time where Black British Studies is still on the periphery of British Cultural Studies, the discussion of a mainstream film like Disney's Tarzan can only draw attention to how a film enjoyed across races can carry subtle and implicit messages detrimental to the (self-)perception of particular groups within British society. Black British Cultural Studies to date has focused on two things. Stuart Hall (1990: 225) - known as being one of the founding fathers of British Cultural Studies - suggests this as being centred around the 'traumatic character of "the colonial experience"'. It defined the ways dominant and normalised regimes of representation have led black people to experience and view themselves as the 'Other': the psychology behind how colonialism has been internalised by the colonised (Fanon, 2008). This is the biggest challenge the black diaspora currently faces in Britain. Where stories of racially based police brutality are a recurring theme in the US, examples of the marginalisation and exclusion (of non-white people) are ever-present in the prevailing theme of diasporic belonging where 'Britain is my home but I am not English' (Williams, 2012). This marginalisation most recently has presented itself when the experiences, perspectives and contributions of the African diaspora are omitted from British curriculums and academia. It is worth mentioning that, at the time of writing, I feared this article would not register with those who could not immediately relate. This conversation - as any that relates to race usually ends up being - is awkward. There has always been a tendency, particularly noticeable in Britain, to compare our own less physically violent encounters with race to those that we hear about in the US. However, whilst the slew of race-based killings from Stephen Lawrence in 1993 to Damilola Taylor in 2000 may no longer be at the forefront of public conversation, the popularity of movements such as 'Why is my Curriculum White?' and the 'Rhodes must fall' campaign indicate a growing awareness of racial issues in Britain. This is further reinforced by the fact that both campaigns were led and supported by young people across all racial demographics. Despite these campaigns, these issues are not being marked by substantial change. In regards to the former, whilst the student body better represents the diversity of the UK, those in academic positions of note does not. The Guardian reported that 'black British-born staff make up only 1% of full-time staff, representing just 85 out of 18,510 university professors' (Andrews, 2016). Andrews rightfully questions how much good a more diverse campus can do if the knowledge taught remains un-democratised. As for Rhodes Must Fall, The University of Oxford ultimately refused to remove the statue of Cecil Rhodes, citing 'overwhelming support' as the basis of its decision (Rawlinson, 2016) over overwhelming outrage. Understanding that the most publicised issues that characterise contemporary British society revolve around education, it is important to note that at the time of the release of Disney's Tarzan, nothing about Africa was taught in British schools. If something is not learnt in formal education, then it is reasonable to infer that it will either be learnt outside of the classroom or not at all. I have earlier argued that mainstream knowledge of Africa accepted as true or being present in one's mental imagery of a place derives mainly from popular culture. The mass media have both already defined and continue to define what Africa is and who those from Africa are. These definitions are internalised by all who are not exposed to knowledge that challenges these images presented solely for entertainment value (Obey 2008: 5). Blunt (2003: 282) describes the term 'diaspora' as implying 'a scattering of people over space and transnational connections between people and places'. She adds that geography is central to diaspora both as a concept and as lived experience. This is because the diasporic experience encompasses the interaction between place, home, culture, identity and belonging, which produces the diasporic consciousness (Zeleza, 2008: 6-7). In this way, diasporic identities fit into the space of intervention between essentialist hegemonic narratives of the relationship between race, culture and nation (Mitchell, 1997: 260). Diaspora is also a part of what Homi Bhabha dubbed the 'Third Space' in The Location of Culture (2004). By forming part of the space within the margins that is 'simultaneously a state of being and process of becoming' (Zeleza, 2008: 7), diaspora entails a culture and consciousness concentrated of a 'here' separate from a 'there' where the 'here' sometimes characterises a regime of marginalisation. By this I mean, the diasporic African in some ways identifies as being from the Western metropolis. However, within the metropolis we also recognise our own difference and as such experiencing ourselves as an 'Other' (Zeleza, 2008: 7; Hall 1990: 225-26). Al-Mafedi (2011: 4) explains that space is imbued with notions of belonging or non-belonging. For example, in Disney's Tarzan, the audience understands Tarzan as not quite belonging in Africa because it has been conflated in Western imagination that 'true Africa' (sub-Saharan Africa) is Black Africa (Zeleza 2006: 15). Tarzan is not truly 'African' on the basis of his whiteness. The story of Tarzan makes it clear he is not supposed to be given the constant reference to his not belonging in the jungle. In truth, he only belongs insofar as his identity is shaped by his experiences, which have all been in the African jungle. However, where the opportunity arises to go 'back home', hypothetically he should take it. To expand on the supposed requirements of African-ness, I use myself as an example. Zeleza (2008: 16) mentions the 'critical measure of the diaspora condition as a self-conscious identity lies in remembering, imaging and engaging the original homeland'. Being born and bred in the West grants me citizenship, as does the fact my first language in English and, in this way, I can be British. However, the question remains that, if I was born and raised in England, if all of my experiences thus far in terms of locality have been restricted to England, why can I not be English? Blunt (2003: 286) suggests that being truly 'at home' in Britain rests on whiteness. Imaginative geographies of Africa and England are racialised whereby whiteness is constructed in the collective consciousness and articulated within discourses of Englishness - with which blackness is incompatible (Makdisi 2014: xvi). Simply put, my African-ness is evidenced by my blackness, which means I cannot be English. I can be said to both belong and not belong in Britain (more specifically England) as I am in many ways 'the Same' but my race is unalterably different. My blackness is the primary way I engage with my 'original homeland', despite never having been to Nigeria (or Africa at all) nor being able to speak Yoruba. Ahmed (1999: 93) explains that this is in part due to the perceived invisibility of whiteness. Blackness is too visible in its deviation from whiteness for it not to be real, already marking me as different (Ahmed 1999: 93; Fields 1982: 145). By this I mean, as soon as I - as a black person - am seen, I can no longer be English as it is whiteness that defines the English nation-space (reinforced by Ahmed, 1999: 94). This self-conscious identity that Zeleza described expresses itself in receiving and answering questions asking 'Where are you from?' The diasporic condition understands that my blackness means I must originally be from somewhere else that is not Britain. This is because the politics of race supersedes all notions of nationality where Englishness is exclusively white and blackness conjures 'Africa' (Fields 1982: 145). The previous section established that a politics of race colours different nation-spaces and has particular implications for notions of true belonging amongst diasporic Africans in Britain (Hall 1999; Bhabha 2004). This being the case, one can assume that there exists an important distinction between being Anglicised (and thus British) and being English. From here, a discussion of the meaning and relevance of 'home' in hyphenated diasporic spaces becomes necessary. The idea of the 'home' is the most familiar and significant example of place for any person as such is intrinsically linked to all discussion regarding belonging (Cresswell 2012: 24). Tuan (1991) argues that identity is formed in large part by experience and the experiential perspective that guides all a person knows and their construction of reality (see in particular p. 8). Taiye Selassie discusses this phenomenon in detail in her TED talk Don't ask where I'm from, ask where I'm a local (2015). Her arguments match closely with those of Tuan in noting that the key issue of questioning where a person is actually from and where they are allowed to be from lies in the omitting of the fact that identity is primarily experience and all experience is local - rooted to the places you are familiar. In this way, it is easy to see how a diasporic African can feel a dual sense of British-ness (the country of their birth) and African-ness (or specifically the country of their parents' birth). Reference to Disney's Tarzan helps to make this clearer. The entire storyline of the film is based around the presupposed 'wrongness' of Tarzan's notion of the African jungle as home. Tarzan's conception of where his home was and should be were presented as out of alignment in constant referrals to him not belonging in the jungle. Thus, whilst the jungle was home for Tarzan in its familiarity, it is constantly either explicitly mentioned or alluded to that the African jungle is not home for him in the same way it is for non-human animals. If one refers back to the film, the references to belonging are numerous. For example, at the beginning of the movie where Kala first finds and adopts the orphaned baby Tarzan, he is not accepted by the gorillas. Throughout most of the film, Kerchak treats Tarzan with disdain, constantly reiterating that Tarzan does not belong and that he was not one of them. As if this was not enough, even the younger gorillas presented as Tarzan's closest friends point out his difference, at times excluding him from their games and social circle. The alienation and isolation Tarzan experiences in the film is closely intertwined with the concept of his identity and identity confusion. According to major scholars in British Cultural Studies such as Frantz Fanon (2008), Stuart Hall and Homi Bhabha (earlier discussed), this is life on a page for diasporic individuals. The question of 'Where I am?' is closely related to 'Who I am?' However, a tension exists in this relationship where one needs the agreement of the surrounding society to legitimise this association. From the film's inception Tarzan tries to gain Kerchak's acceptance and love by learning to behave like a gorilla. He learns to navigate the space better than even a gorilla by climbing, swinging from vines and jumping from cliffs. However, despite Tarzan mimicking attributes portrayed as native to the jungle such as swinging from vines and communicating in grunts, his belonging continues to be questioned. This suggests a link between the limitations of mimicry, belonging and notions of home. Assimilation simply cannot be learnt (Mayer 2002: 63). The character of Kerchak confirms as much in the film in saying to Tarzan 'You can't learn to be one of us'. A possible criticism of the points that I have made so far is how far my arguments hitherto regarding Tarzan's belonging in the jungle remain valid given his (as well as Jane and the Professor) decision to remain rather than return to England. At first glance, this ending is overwhelmingly positive in showing that ultimately love (rather than difference) defines a family and finding a home. However, this does not detract from the fact that Tarzan spends approximately 68 minutes of an 88-minute long movie desperately trying to fit in and find his place. This changes at 77 minutes when he finally proves himself to Kerchak of being worthy by defeating Clayton. It is only then that Kerchak apologises, concedes that Tarzan is and has always been one of them and calls Tarzan his son. This is of huge concern. Tarzan's closest 'father' figure barely seems to tolerate him until this moment. Yet, Tarzan still does his best to be a part of a society that never fully embraces him as 'one of them' till the very end. This makes Tarzan's decision to stay in the jungle after Kerchak asks him to - even after a lifetime of poor treatment! - baffling. One would suppose that the decision he made to go back to England would remain unchanged after defeating Clayton. This is because all other factors that contributed to his original decision to leave remained unchanged after Clayton's defeat except Kerchak's acceptance and respect. The issue with this is that home and understandings of where the home is, is an extremely personal exercise, yet throughout the film Tarzan's decision to stay or leave seemed subject more to the will of other characters than himself. Cresswell (2012: 24) points out how home at its core is the centre of rootedness and attachment, which poses an immediate problem for how home is understood for diasporic Africans. In the Poetics of Space (published first in French in 1958), Gaston Bachelard describes the house/home as the primal space that frames our understanding for all the spaces outside (see also Cresswell 2012: 24). It is within the home that experience is most intense. This is how the notion of 'home' and where the home is becomes one of ontological difficulty. Deciding for somebody else where their home is and where it ought to be reflects an obvious and untenable dismissal of individual experience, attachment and rootedness. The 'host-land/homeland' distinction present in the lives of every diasporic person makes this point clearer. I again use myself as an example. In Nigerian culture one typically traces their lineage back through their paternal side. In which case, if asked 'Where are you from?' (i.e. Where is your true home? ), I would have to answer 'Ilesa, Osun State, Nigeria'. But that is a complicated statement of identity. I may trace lineage to Ilesa, but the familiarity necessary to make somewhere in Ilesa home is missing purely by virtue of my never having been. Thus, the question 'Where is home?' becomes problematic as for me home might be here (being Hertfordshire, England). Hickman et al. (2005: 178) suggests that visible minorities must actively stake their claim for 'full acceptance' as British in a context where their difference is designated/recognised on sight. If belonging in any context was assumed, then a perfect British accent would be enough to denote Britishness. Just as if belonging was an assumed right to be held by all, Tarzan would never have to negotiate or doubt his identity or place in the jungle. In this way, it could be said that the boundaries of 'home' take on imagined geographical importance that, when not in alignment with mental and emotional boundaries, can supplant the emotional aspect of home. If 'home' was understood in the way Bachelard (1958), Tuan (2001) and Cresswell (2012) define it, then home for me is found in a tiny town in Hertfordshire, England. As I consider my home to be in England, one could reasonably suggest that my home is then, by extension, England. This would in theory afford me some degree of English-ness. However, the reality is that racialised notions of nation-spaces mean that, regardless of where the diasporic African considers their home to be (whether in England or Nigeria), one's 'true' home and nationality must be in accordance with their race. Whiteness cannot be learnt and marks the boundary of Englishness and its increasingly common assertion as an ethnicity (Hickman et al. 2005: 161). This is the experience of dislocation and displacement for members of the African diaspora in Britain (Ashcroft et al. 2002: 218) where the diasporic African is in essence disallowed from defining their 'true' home as being in England. In essence, 'identities are the names we give to the different ways we are positioned by, and position ourselves within' (Hall 1990: 225). Diasporic identities are complicated and displaced due to being positioned for us rather than by us. Proving one's Englishness is not a simple exercise. A black African could have lived in Britain from birth, speak flawless Queen's English, and only eat 'traditional' British foods. However, diaspora - of which race is the ultimate indicator - is a condition that cannot be overcome. Tarzan teaches us certain facts about Africa both explicitly and implicitly through the absorbed images of the scenes, and as a result Africa is viewed from a Western perspective whilst African voices are silenced. Animating and marketing a story towards children necessitates caution, given their unlikelihood to critically assess the information presented. In not being recognised as a real tool of knowledge dissemination, Disney productions manifest a dangerous and silent form of power embedded in who is able to represent what and how. This entire paper is positioned and written in a place of context. In doing this, I take inspiration from Stuart Hall in trying to show how I - as a British-Nigerian - am a product and agent of both real and imagined cultures. By doing this, I hope to have made a case for the revisiting of Disney movies to be read as well as watched as visual and textual pieces through the lens of cultural representation having psychological effects on lived everyday experiences. I thank my tutor Dr Marijn Nieuwenhuis who was a source of great support and encouragement. His guidance was essential to the writing of the original essay on which this article is based. I also thank my parents who were my greatest strength and comfort during this time. They have always shown a deep interest in my academic studies and, without them, I would not have had the confidence to complete the writing of this paper. Oyinkansola Fafowora (known as Honey) recently graduated with a Bachelor's degree in Politics and International Studies from the University of Warwick. During the writing of this article, Honey discovered an interest in social anthropology which she will study at the University of Oxford. Burroughs, E. (1997) Tarzan of the Apes. Dover Publications, Inc.
Conrad, J. (1990) Heart of Darkness. New York: Dover Publications, Inc.
Giroux, H. and G. Pollock (2010), The Mouse that Roared: Disney and the End of Innocence. Maryland: Rowman and Littlefield Publishers, Inc.
Gregory, D. (2004), The Colonial Present: Afghanistan, Palestine, Iraq. Oxford: Blackwell Publishing Ltd.
To cite this paper please use the following details: Fafowora, O. (2017), 'Imagining the 'Dark Continent': Disney's Tarzan and Defining the African Post-Colonial Subject', Reinvention: an International Journal of Undergraduate Research, Volume 10, Issue 1, http://www.warwick.ac.uk/reinventionjournal/issues/volume10issue1/fafowora. Date accessed [insert date]. If you cite this article or use it in any teaching or other related activities please let us know by e-mailing us at Reinventionjournal at warwick dot ac dot uk.